Something really cool happened the other day. Something I never thought would happen in my days of overthinking food and my obsession with perfection around food overall. It’s been a few months since I dropped all the food rules and went on the intuitive eating bandwagon. Something so different, and so new to me. Something I probably hadn’t done since I was a very young child. I started out with the mantra of “I can have anything I want.” And that meant ANYTHING. White refined flour, spinach, sugary sweets, meat, you name it, if I craved it, I honored what my body asked for. My biggest fear? Obviously losing control. Or going so far in the opposite direction that I would lose grip of everything. I can certainly tell you that is not at all what happened and this simple little thing that happened made me feel really good about my growth and how much freedom I now have.I was organizing the pantry over the weekend. As I sorted through my ungodly amount of nut butters, I noticed the Nutella. In noticing the Nutella, I remembered that earlier in that week I had seen it and thought, hmmmm, does Nutella sound good right now? And it didn’t. So I went right on with my day not thinking about it again until that day as I was organizing the pantry. This may seem so petty, but this is such a powerful testament to what this new journey has done for me. Before, I wouldn’t be able to keep the Nutella in the house because I would be so afraid that one bite would set off a panic and then I would just eat the entire jar. That would be followed by guilt, shame, lots of overexercising and restricting, and so on and SO ON. But that is not at all what has happened. The last time I got out that jar was probably 3 or so weeks ago, and since then had all but forgotten about it aside from the random interactions I had with it and I was happy to take it or leave it. THAT my friends is the power of letting go of the rules. That is such a huge leap and win for me in this journey and I now know how far I have come. Say no more to the rules. Just let them go! Ok friends, I kid you not, I am swimming in kale right now. I mean, as great as kale may be, I would prefer to swim in something more like chocolate if I had to choose a food. 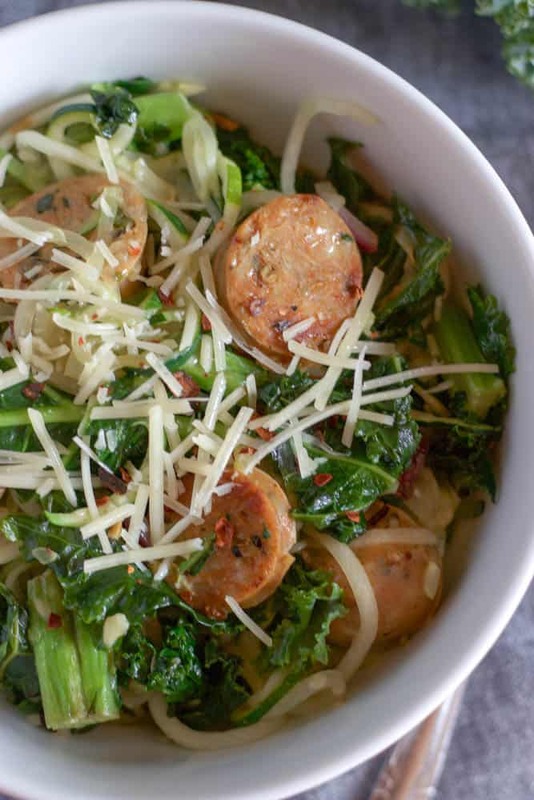 There IS such a thing as just too much kale. Sorry, I said it. Kind of like the smoothie I tried to make recently that was a few touches overboard on the curly green stuff. Yuck. My garden this year has been hands down the most successful. I have already harvested several bunches of broccoli, lots of zucchini, strawberries, tomatoes, peppers, and KALE. Most of all kale of course. It’s so interesting because the last two years my kale was eaten up by my garden friends before they became much of anything at all. So I planted 4 kale plants hoping one would give me a leaf or three. Boy oh boy was I surprised this year! I guess the bunnies were over the kale and moved on whatever the next veggie trend is?? 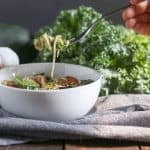 Who knows, but we have been adding to all sorts of recipes and since I had several zucchinis and lots of kale, I knew I needed to toss something fun together. My latest obsession is Italian Chicken Sausage. If you know the Mike’s Red Hot commercial, that’s me, but with chicken sausage these days. I put that %$#@ on everything. I really do. And it has made it’s way into a majority of the pasta dishes I have made recently so you better believe it would be in this one! My absolute favorite is from Trader Joe’s. So good. And the ingredients are on point so an added bonus! On busy nights, I like to whip up either regular pasta, zucchini noodles, or a little bit of both mixed together, toss it with some garlic, marinara and sautéed chicken sausage sliced up. It’s my typical “I have no clue what to make for dinner and I don’t want to do a lot of work for it” kind of meal. And it is Anthony approved so no argument there. 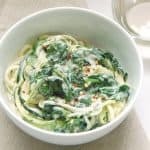 I have another zucchini noodle recipe that is my favorite for a creamy pasta dish using cashews for the cream sauce. This dish however is a bit less heavy if you are looking for a nice light pasta dish with a touch of garlic lemon and olive oil. Top it with some fresh parmesan and you have got yourself a meal! And if your grocery runs out of kale and you know where to find me, I am happy to share! 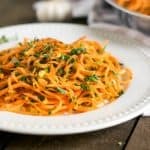 Using your spiralizer, spiralize the zucchini into noodles. Over medium high heat, cook the sausages in 1 T olive oil until cooked through, remove from pan and set aside. Heat another drizzle of olive oil in skillet. Cook onion and garlic until onion becomes translucent. Add kale and sauté until wilted. 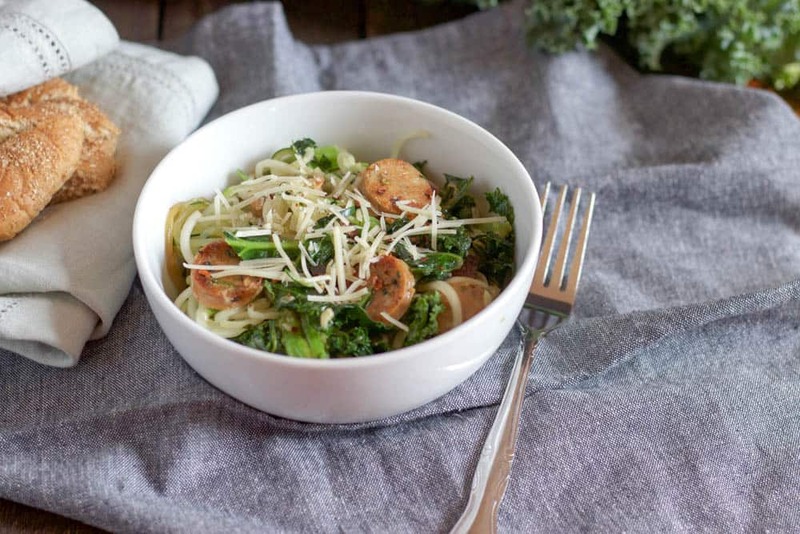 Add in zucchini noodles and toss to combine with kale until heated through, about 3-5 minutes. Add sausage back in along with parmesan, red pepper, lemon zest and sea salt and pepper to taste. Toss to mix through. Add another tablespoon of olive oil if desired. Garnish with extra parmesan if desired. Sometimes I find that zucchini noodles get a bit water logged. I lay them over paper towels, add a bit of salt and try to absorb some of the water. Making sure not to overcook them helps as well!